..aryanna nadyne || full of life and hope..: August birthday celebrations & Salam Ramadan! Every year in August, we celebrate birthdays of Pak Su (10th), Tok Abah (15th) and Mommy (17th). This year, Tok Abah's birthday fell on a Saturday. Hence, the big celebration dinner was held on that particular Saturday night. Everytime there's a celebration dinner, we will decide on where to go. Sometimes it can be somewhere new and sometimes places that we've been to and like. This time we decided to have dinner at the PJ Hilton hotel. It was my first time there though everyone else have been there for quite a number of times before. There were supposed to be 10 of us; myself, Mommy, Dadda, Tok Abah, Tok Mama, Pak Su, Aunty Huda, Mak Lel, Aunty Ina and Aunty Min but Mak Lel and Aunty Min couldn't make it at the very last minute. We had a buffet dinner and there were quite a variety of food! Enjoying my meals with Mommy & Dadda..
Everyone obviously enjoyed the food and had a really good time. We talked and laughed and made jokes and towards the end, presented Tok Abah with his birthday gift which Mommy and Tok Mama had bought earlier during the day. We all shared (at least the adults did...) and bought Tok Abah a new phone. Mommy said Tok Abah had a really old phone which was a classic and had existed since the middle ages (I don't know when that was!). So, now, Tok Abah has a brand new advanced handphone which he can carry everywhere and not hide behind a door whenever he answers the phone. Tok Abah getting his birthday present from me! I was actually just recovering from viral fever so my appetite wasn't as good as always, although I did eat bits of pieces of whatever Mommy took for me. Besides that and a baby who couldn't stop crying at a table behind us which made me very uneasy, we had a blast! Pak Su got new garments from top to bottom from everyone. On Sunday, we spent sometime with Mama and Papa, together with Tok Abah and Tok Mama at a hi-tea event where I had more good food! Before we headed home that night, Aunty Huda and Mak Lel gave Mommy her birthday present. They gave Mommy a new bag which she really loved and on midnight, at home, Dadda gave Mommy a present too! It was also a new phone but a different one from Tok Abah's, of course. Mommy was delighted to see the new phone that she's been eyeing on for quite sometime. We wished Mommy Happy Birthday and gave her hugs before we went off to bed. On Monday, Mommy's birthday, she had to go to office very early in the morning. I didn't get to see her when she left but she and Dadda came back earlier than usual and we went to Subang Jaya for a swim with Tok Abah, Tok Mama and Pak Su. 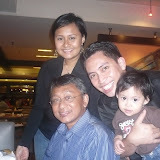 After that, Tok Abah treated us to a nice dinner at the restaurant we went on Mother's Day and Aunty Huda joined us. Check out the full pictures of the awesome birthday bash we had below! So, to sum it all up, last weekend was a wonderful weekend filled with celebrations, presents and food!